If you are a native English speaker, there are many tour guide jobs in popular tourist areas leading visitors around well-known sites and offering vital information about famous attractions. Major tourist spots such as the Alhambra in Granada and La Sagrada Familia in Barcelona run tours in multiple languages all year round, so finding work as an English speaking guide is a great source of work. There are also companies which specialize in offering walking tours or minibus tours in certain areas of Spain which are led by an English speaking representative, and this is also a good place to start looking for a job if you have good people skills, a confident manner and excellent organizational abilities. Many English speakers prefer to stay within ex-pat communities rather than trying to find work in a more Spanish-oriented area. Lots of these communities are in areas that are also popular with tourists, for example in the Costa Blanca, Costa Dorada and Costa del Sol regions. In those areas there are plenty of pubs and bars which are run by English-speaking owners and which employ English-speaking staff to deal with the countless British tourists who frequent these regions during the high season. Even if you have had no previous experience of bar work, you are likely to be able to find training on the job as staff turnover is quite high in these areas. English is a popular second language in Spain with many children learning it in school. There are therefore plenty of tutoring opportunities and work in language schools for those who are native English speakers. 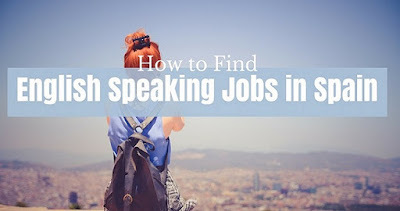 You are especially likely to be successful in finding this type of work if you have some previous teaching experience or if you have a TESL (Teaching English as a Second Language) or TEFL (Teaching English as a Foreign Language) certification. If you are experienced in watersports such as jet skiing, scuba diving or snorkeling, you have a good chance of finding work in tourist areas as an English speaking activities leader or instructor. In coastal regions that have many overseas visitors there is plenty of seasonal work in this field which is ideally suited to someone looking for a job that combines their hobby with the opportunity of making money. With such a strong tourist economy in Spain, there are many restaurants in popular tourist areas that are always on the lookout for staff. If you are a qualified chef, you will find many openings within hotels and eateries in many of the coastal regions or in major tourist cities like Barcelona, Madrid, Granada and Seville. If you are looking for an entry level position, restaurants in tourist areas often employ English speaking waiting staff although a basic knowledge of Spanish would be an advantage. Hospitality and the hotel industry is big business all over Spain and those who speak English are at an advantage as long as they have a good knowledge of Spanish too. There is a great variety of work within the hospitality industry including roles working on reception, in administration or in housekeeping positions. For those with previous experience working in hotels there is even greater variety of roles on offer including management opportunities. Jobs in Spain for English Speakers. As an English speaking employee, you should find it relatively easy to find work in any of the tourist shops which are clustered around the Spanish coastline. Catering almost exclusively to the tourist community, this type of work may be seasonal but has a high staff turnover, which makes it easier to obtain employment. These types of jobs are suited to those who are looking for an entry level position as they are accessible even to those with no prior experience.